I’ve been working with PostGIS quite a lot lately, and found myself faced with the problem of being able to easily visualize the results of my queries on a map. CartoDB has spoiled me with a big fat SQL pane and a slippy map that instantly shows you the results of your query, and allows you to iterate quickly and tune your queries to suit your needs. 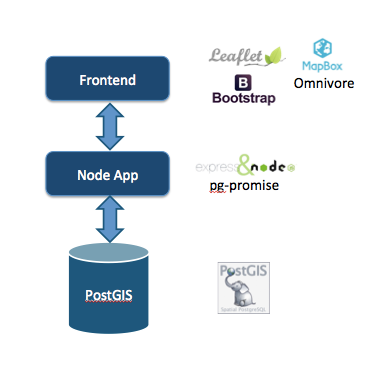 It’s a great workflow, and I found myself wanting for it after standing up PostGIS locally. #postGIS people, is there is “Preview” tool that will allow for quick rendering of geoms on a map (a la @CartoDB)? I got quite a few responses. Some recommended CLI tools that render maps in the terminal, some proposed programmatically sending the results to geojson.io, some said to use QGIS (but you still have to click a few times to specify the geom column and add the layer, then you would need to delete it before starting the next iteration). Here’s a basic architecture diagram. The backend is a simple node.js server that talks to the database and sends the response data to the frontend. The frontend at its simplest is a leaflet map and a textarea to write SQL into. The Node App is a super-simple express.js api with a single endpoint, /sql. This endpoint expects a PostGIS Query as a URL Parameter “q”. This query is then passed to pg-promise, which sends it along to the database. That’s about it, the whole backend is 60 lines of code plus dependencies! On the frontend, we have a single HTML page with a leaflet map and a textarea to write your SQL in. When you click the submit button after entering a query, it is sent to the backend as a URL param using Jquery’s getJSON() method. var features = omnivore.topojson.parse(data); //should this return a featureCollection? Right now it's just an array of features. The topojson response is processed using omnivore, a great little JS library by mapbox that can convert various geospatial data formats. The output is geoJSON geometries that can be rendered in Leaflet using L.geoJson(). – Add Codemirror instead of a text area for pretty SQL formatting. – Use localstorage or something to store the last n queries so you can recall them later. Pull requests are welcome! Here’s the code on github. Please give it a try and tweet at @chris_whong to let me know what you think.